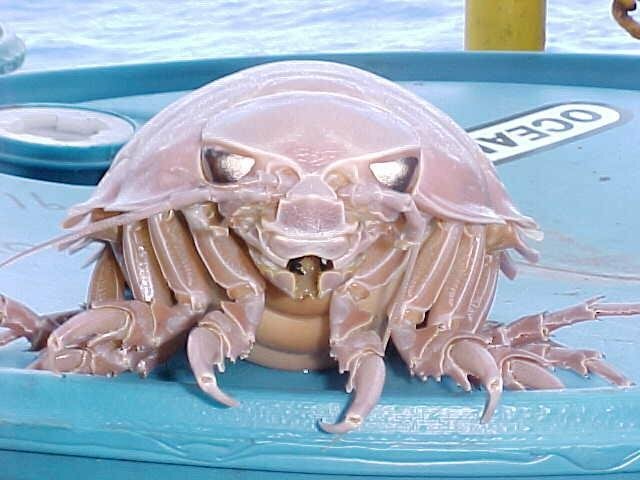 The giant isopod is a crustacean that can be found in abundancy in the deep, cold waters of the Atlantic. They can be found from the gloomy sublittoral zone at a depth of 170 meters (560 feet) to the pitch darkness of the bathypelagic zone at 2,140 meters (7,020 feet), with the majority of them living in depths between 365 and 730 meters (1,198 and 2,400 feet). Giant Isopods are considered to be living fossils, as they have stayed virtually unscathed for the past 130 million years. 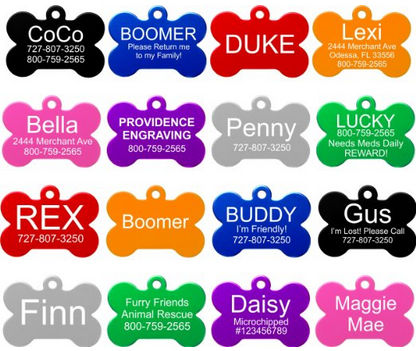 Adults have a length of 19-36 cm (7.5 and 14 in), a maximum height of 76 cm (30 in.) and a maximum weight of 1.7 kg (3.7 pounds). 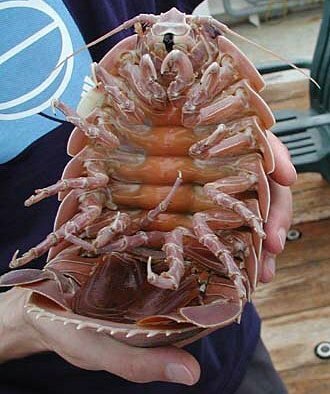 They exhibit deep-sea gigantism, just take into consideration that the majority of isopod species have a length of only 1 to 5 cm (0.3-2 in). Their color is pale lilac. They are dorso-ventrally compressed, protected by a rigid, calcareous exoskeleton composed of overlapping segments. The first shell segment is fused to the head while the posterior segments are fused as well, forming a "caudal shield" over the shortened abdomen. They have large, highly reflective compound eyes with about 4,000 facets and two pairs of antennae. They have seven pairs of legs, with the first one being modified into maxillipeds that manipulate and bring food to their four sets of jaws. Similarly to woodlouses, to which they are closely related, they have the ability to defend themselvers by curling up into a ball, leaving only their tough shell exposed. Food at the these sea depths tends to be rare, as a result giant isopods have adapted to the long periods of famine they have to withstand. They can survive for more than 8 weeks with no food at all. When they encounter a large source of food (e.g. a dead whale) they will gorge themselves to the point where they can't move! Giant isopods reproduce by laying eggs which are believed to be the largest among all marine invertebrates, having a diameter of 1.3 cm. Sexually active females develop a brood pouch (also known as marsupium) where the eggs are retained safely within for an unknown period of time. Younglings emerge as adult-miniatures and are called mancas. The only difference when compared to adults is that they lack the seventh pair of pereopods.